CHARLOTTE – Jan. 24, 2011 – The Charlotte Teachers Institute (CTI), in partnership with local cultural organizations and foundations, will host “Exploding Canons: The Unexpected Impact of Romare Bearden,” Thursday, Feb. 10, at 5:15 p.m., at the North Carolina Dance Theatre (NCDT). CTI is a high-quality, intensive professional development program involving UNC Charlotte, Davidson College and the Charlotte-Mecklenburg Schools (CMS). 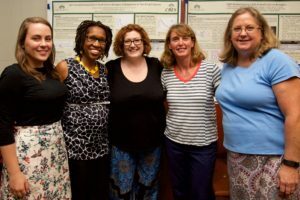 “Thanks to innovative collaboration and generous grants from our supporters, CTI is able to also engage and educate teachers and the Charlotte community-at-large through its ‘Exploding Canons’ events,” said Institute Director Molly Shaw. This event is among many community events that will celebrate this world-renowned, Charlotte-born artist during a year-long, 100th anniversary celebration of his birth. Bearden is best known for his arresting collages incorporating visual metaphors gathered throughout his life, including his youth in Mecklenburg County. His work is represented in major museum collections, including the Metropolitan Museum of Art, the Whitney Museum of American Art, the Philadelphia Museum of Art and the Museum of Fine Arts, Boston. The “Exploding Canons” event begins at 5:15 p.m. with a reception, featuring jazz music by The Queens Collective and original Bearden art exhibited by Jerald Melberg Gallery. Participants will also be able to view NCDT dancers rehearsing for the company’s World Premiere ballet inspired by the life and work of Bearden, along with slide videos of his work from the collections of The Mint Museum and the Harvey B. Gantt Center for African-American Arts + Culture. Jerald Melberg of Jerald Melberg Gallery will serve as the panel moderator. Melberg was curator of The Mint Museum of Art from 1977 to 1982, where he organized the first major retrospective of Bearden’s work. This event is free and open to the public. Space is limited, so registration at https://charlotteteachers.org is recommended. CMS teachers and administrators from all grade levels and subject areas are especially encouraged to attend. The North Carolina Dance Theatre is located in uptown Charlotte at 701 N. Tryon St. in the Patricia McBride and Jean-Pierre Bonnefoux Center for Dance. This “Exploding Canons” event is sponsored by the Charlotte Teachers Institute, the John S. and James L. Knight Foundation, the Arts & Science Council and the Chancellor’s Diversity Challenge Fund at UNC Charlotte. Cultural partners include the North Carolina Dance Theatre, Jerald Melberg Gallery, the Gantt Center for African American Culture + Art, and The Mint Museum. “Exploding Canons” leverages the partnerships among CTI to offer educators and the public collaborative educational opportunities that highlight university and college faculty, explore diverse topics in an interdisciplinary manner, and encourage community conversation. The Charlotte Teachers Institute, a collaboration among Charlotte-Mecklenburg Schools, Davidson College and the University of North Carolina at Charlotte, cultivates content-knowledge, creativity, leadership skills and collaboration within and among Charlotte’s public school teachers. CTI’s “Exploding Canons” events engage and educate CMS teachers and the community-at-large, as CTI and Charlotte’s cultural organizations produce forums for university faculty to examine topics through multi-disciplinary lenses. CTI is made possible by generous support from the Arthur Vining Davis Foundations, the Wachovia Wells Fargo Foundation, the Belk Foundation and the Charlotte Mecklenburg Community Foundation. Posted on January 24, 2011 by Robin Mara. This entry was posted in Press Releases. Bookmark the permalink.